Here are three easy and simple tips that will help you dress up your spring look! Get creative and transform a vintage-style brooch into hair décor! With just a few bobby pins to secure your brooch, your hair will go from good lookin’ to retro glam! Whether your hair is flat after a long day at work or you want your up-do to have a little “umph”, “back combing” (or teasing) will give you some added shape for the full look you love! Start with taking a small section of hair at the crown of your head. Use a wide-toothed comb (with thin teeth) to brush out your hair so it’s smooth. Pull the section straight up in the air and use the comb to lightly brush down the hair in the opposite direction that it grows. Be sure to move your hand in a circular motion to prevent tangles. Repeat this technique with one or two more sections, moving down the back of your head. Use a flexible hair spray (like Paul Mitchell Super Clean Spray) to spray each section after you back comb. When you’re finished, lightly comb each section down and cover the back combed pieces with smooth hair to give the appearance of added volume. To “un-do” the back-coming, use your comb to lightly brush out your sections from the ends to the root. Looking for a way to dress up your everyday ponytail? After securing your hair with a hair band, pull a long, slim piece of hair from the bottom of your pony. 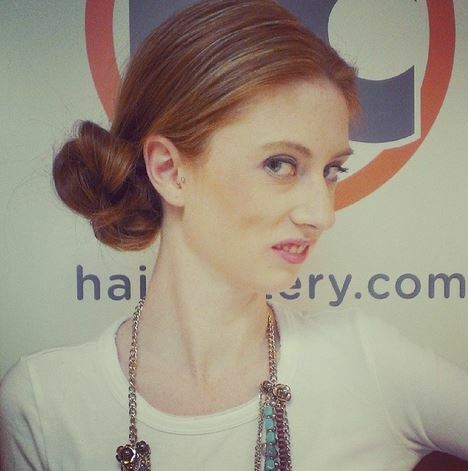 Simply wrap your piece of hair around the hair band until it’s fully covered and back at the bottom of the pony tail. Secure with two bobby pins (create a secure grip by criss-crossing your bobby pins at the scalp). For an even dressier look, wrap your pony tail around the base of the hair band and pin into place, creating a perfect bun for day or evening! Enjoy your season of special occasions and love your look with style tips and tricks from Hair Cuttery!